Harriet and Shadi got married at Dumbleton Hall in Worcestershire/Gloucestershire on the most gorgeous of Spring days. After the wedding ceremony, the wedding guests enjoyed reception drinks and canapés on the terrace which overlooks a lake, and were serenaded by a singing duo. After 25 minutes of formal photos with the bride and groom's closest friends and family, we took some time to capture those all important images of the couple on their own. 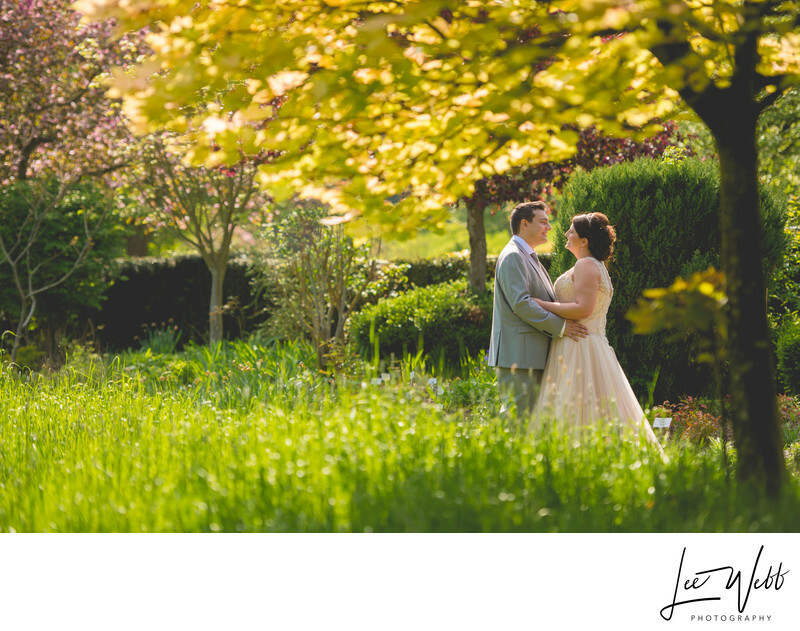 As the midday sun was bright and harsh for photography (as well as it being rather hot in direct sunlight) we started off photographing the bride and groom in the shade of the trees that are dotted around the grounds of Dumbleton Hall. A short distance away was a patch of long grass by which sat this tree that was just glowing in the Spring sun. I knew immediately that I wanted to frame the image as you see here, in order that I could frame the bride and groom with the long green grass shoots at the bottom of the image, and the dazzling yellow at the top. The sun hitting the side of the bride's dress provided the perfect illumination for the couple, giving gentle up-lighting and lifting the shadows on their faces.